Despite all other craniodental adaptations, the head of most bats must function as an ultrasonic emitter and receiver. Not all echolocation calls are ultrasonic, but all either are emitted from an open mouth (oral-emission) or are forced through the confines of the nasal passages (nasal-emission), and some nasal-emitting bats alternate between modes as the situation demands. The conspicuous baffles that surround the nostrils of nasal-emitting bats are not ornamental structures; rather, these “noseleaves” serve several important acoustic functions and are considered to be the earmark of nasal-emitting bats. For many readers, the difference between oral- and nasal-emission is viewed as a simple character state, most likely tied to the vagaries of foraging ecology in some tangential manner. 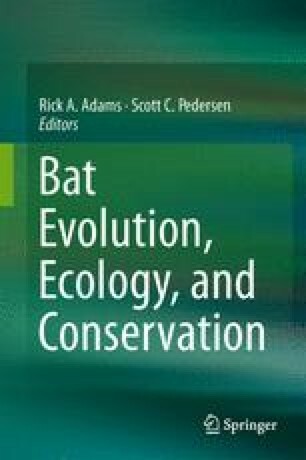 However, Pedersen and Timm (Evolutionary history of bats: fossils molecules and morphology. Cambridge University Press, Cambridge, pp 470–499, 2012) reviewed a considerable volume of literature discussing how the advent of nasal-emitting bats required a dramatic redesign of the microchiropteran rostrum and skull base during development. Nasal-emission is therefore a key innovation responsible for two of the most dramatic morphological radiations in the Chiroptera—phyllostomid and rhinolophid + hipposiderid bats. Herein, we summarize and update that review and then discuss recent advances in the numerical analysis of form and function in regard to the beamforming function of noseleaves (Müller, J Acoust Soc Am 128:1414–1425, 2010). We would like to acknowledge the financial support of Rolf Müller from the following agencies: National Natural Science Foundation of China, Shandong Taishan Fund, Shandong University, NSF (Award Id 1053130), US Army Research Office (Grant Number 451069), and National Aeronautics and Space Administration (Grant Number NNX09AU54G). We further acknowledge Dane Webster for his rendering of Hipposideros (above). We extend a well-deserved thank you to several graduate students who have worked in the Müller laboratory: He Weikai, Yan Zhen, Lu Hongwang, and Gao Li.